Jim Rooney grew up in South Boston. “It was a gritty urban waterfront district with warehouses and railroads and everything else you’d see in the movies,” he says of what’s now one of the hottest real estate markets in the country and a district dotted with tech firms and shops selling $30-a-pound cheese. Now the executive director of the Massachusetts Convention Center Authority, Rooney is one of the names behind the area’s newly released transportation plan. Along with city officials, business leaders, Massport and even the Massachusetts DOT, he’s been watching the area’s literal sea change, and realized two things: 1. This once-polluted waterfront is now the fastest-growing urban area in the state, and 2. In it’s current form, transportation infrastructure won’t keep up. But transportation actually drove the neighborhood’s boom. Between 2000 and 2013, developers erected around a million square feet, adding 4,100 new residents and 7,700 jobs. 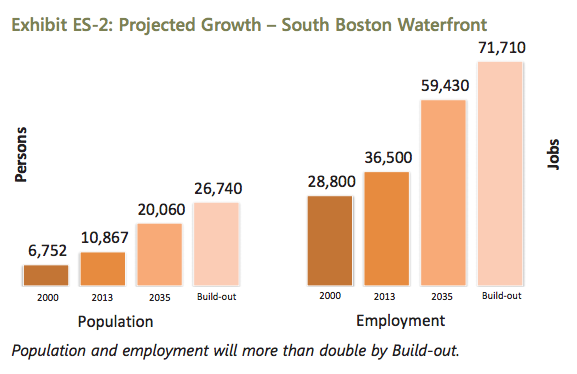 Now dubbed the South Boston Waterfront District — also the Innovation District — its growth followed several large-scale public works projects. One, a freeway megaproject often referred to as The Big Dig, gave the harbor-side area easy access to Logan International Airport and northern Boston via freeway. Plentiful parking followed. The city’s BRT Silver Line has been another contributor. “Transportation was the catalyst,” says Rick Dimino, of local business organization A Better City, also behind the new plan. So what needs to change? According to the report, the area is a small, waterside microcosm of cities everywhere. The harbor and freeway create hard boundaries. And all the parking built to accommodate cars driving in? It will probably need to be converted into retail- and living-space. Fittingly, the report advocates transportation suitable for an area forced to shoot up, not out. Some suggested transformations should be relatively easy to accomplish — Silver Line expansions, upgrades to pedestrian infrastructure and new bike facilities. Others sound far more ambitious: urban rail connections, ferry services across the water and even an internal transit route to serve only the district. It’s a vision — albeit a bright one — and not a hard, money-backed proposal with end-dates in sight. The projects will need to be considered and endorsed by the region’s long-range transportation plan, along with state and city plans. And, of course, they’ll need to be funded. But the neighborhood’s growth is projected to continue, and that could actually turn out to be a blessing in disguise where transportation is concerned. Still, around 5,300 new residences are projected to be part of that 17 million, along with six million square feet of new office and retail space. And mixed-use development, taking commuter cars off I-90, could drastically ease congestion. “We want this to be one of the most successful live-work-play centers in the United States, and to see significant pedestrian growth,” Dimino says. Granted, it won’t be a silver bullet. And it certainly won’t be a boon to everyone. As NPR reported in 2013, those $30-a-pound cheeses probably aren’t going to many longtime South Boston natives. Some members of the blue-collar Irish communities that previously populated the area are being priced out, and families aren’t flocking to the district, where “dogs outnumber school children … more than 2 to 1.” So unless all the millennials decide not to have children and move to the suburbs, transportation into the regional job nexus will be a must.